(Bloomberg) -- Australian property stocks are proving largely immune to the worst housing slump in a generation, rallying to the highest in almost three years. Diversified revenue streams, the demand for offices in a growing economy and low bond yields have propelled the S&P/ASX 200 A-REIT Index up 13 percent this year, compared with the nation’s benchmark index, which has climbed 9.2 percent. Fifteen of the 18 stocks on the gauge are in the green, with Charter Hall Group and Goodman Group leading the rally. The last time real estate shares were higher, Australia’s housing prices were climbing after the Reserve Bank of Australia cut borrowing costs to record lows in 2016, fueling demand for property. Those rates have since remained untouched. Australia’s property slump deepened in February as housing prices fell 0.7 percent, and are now down 6.8 percent from their peak in October 2017. Stricter lending standards have dried up the flow of credit to both investors and owner-occupiers. The index’s top stocks, Goodman and Charter Hall, don’t meet the definition of traditional REITs because most of their income doesn’t come from collecting rent, said Pete Morrissey, a fund manager APN Property Group Ltd. For warehouse giant Goodman, a large portion of its revenue comes from development and funds management earnings. The shift to online shopping has also been a boon to industrial property groups like Goodman, said Belinda Ngo, executive director for capital markets at the Property Council of Australia. Goodman, which lists Amazon.com Inc. as its biggest customer worldwide, is up 25 percent this year. Mirvac Group -- the third-best performer on the index -- derives more than half its revenue from residential assets, but has invested in high-quality apartments and built up its office and retail portfolios. The stock has jumped 21 percent this year. The office property market has also skyrocketed. Companies with solid office portfolios have benefited from a strong Australian economy that’s fueled demand for workspaces, Ngo said. Dexus, the nation’s biggest office landlord, is up 19 percent since December. Still, not all companies on the index have been unscathed by the downturn. Stockland, a diversified real estate group that develops residential and retirement communities, set its earnings guidance at the low end of its target range this year, citing weak housing conditions. Some are still cautious after the big rally. Macquarie Securities (Australia) Ltd. downgraded its sector recommendation to a hold from buy earlier this month, citing rising risks in the retail space. Retail REITs such as Scentre Group, which owns and manages the nation’s Westfield malls, and Vicinity Centres were among the worst performers on the index over the February reporting season. Although retail dominates Australia’s REIT market, the index’s other members are pulling the sector higher given growing demand in other parts of commercial real estate, Morrissey said. The negative correlation between government bond yields and REITs is another reason for the surge. 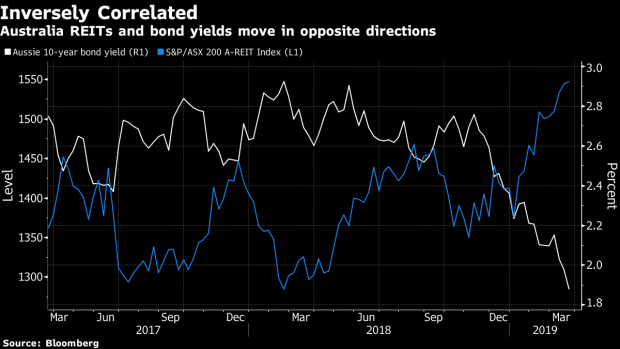 Australia’s 10-year bond yield has continued its decline this year, the lowest since 2016, and yield-hungry investors may be taking cover in REITs. The volatility seen in equities markets late last year could have also helped Australia’s REITs. The stocks could have been seen as a safe bet for investors as they usually perform better as the market gets bumpy, Morrissey said. --With assistance from Wes Goodman and Cecile Vannucci.